Joy Wang, D.D.S., M.S., was appointed as the director of maxillofacial prosthetic services at the UF College of Dentistry effective March 1, 2019. Wang, a clinical assistant professor in the UF Department of Restorative Dental Sciences Division of Prosthodontics, will be responsible for overseeing maxillofacial prosthetic services including maxillofacial prosthetics, anaplastology and related services. This position includes fostering collaborations with multiple departments in the college, other units in UF Health, administration at the Veterans Affair Medical Center, college administration, division team members and external institutions in relation to clinical, educational and research activities. Wang will continue to teach prosthodontics in the predoctoral and prosthodontics residency programs, and provide care in the college’s UF Health Faculty Dental Practice. Wang joined UF in July 2017 after earning her dental degree from the State University of New York University at Buffalo School of Dental Medicine; her master’s degree and a certificate in prosthodontics from the University of Texas Health Science Center at Houston School of Dentistry in 2016; and a certificate in oral oncology and maxillofacial prosthetics in 2017 from the University of Texas MD Anderson Cancer Center. 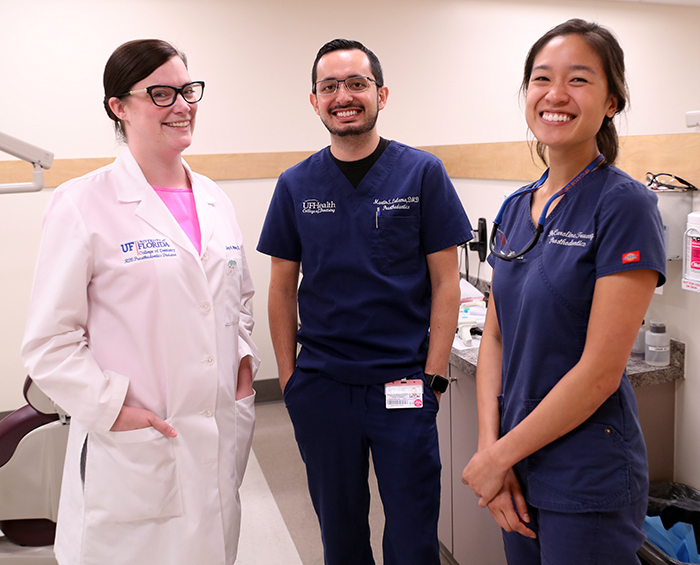 Photo from left: Dr. Wang, and prosthodontics residents Martin Lalama, D.M.D., and Caroline Truong, D.M.D. For an appointment with Dr. Wang or one of our other faculty practitioners in general dentistry or prosthodontics, please call 352.273.7954 or visit the UF Health website here. For an appointment with a faculty practitioner in endodontics, orthodontics or periodontics, call 352.273.7690. For an appointment with one of our faculty practitioners in UF Health Dentistry’s Oral & Maxillofacial Surgery, call 352.273.6731.